Tag line: "Australia's favourite musical comedy"
Jackie Mullins (Jo Kennedy) dreams of becoming a pop star, and with the help of her 14-year-old cousin / manager Angus (Ross O’Donovan), she manages to hook up with a semi-professional band, the leader of which, a guitarist named Rob (Ned Lauder), falls head over heels in love with her. But when superstardom doesn’t come fast enough, Jackie and Angus, who live with their quirky yet loving family above a pub owned and operated by Jackie’s Mom (Margo Lee) and their grandmother (Pat Evison), put together a PR stunt they hope will get them noticed (without a safety net, Jackie walks a tight-rope strung several stories above a public street!). Sure enough, they capture the attention of Terry Lambert (John O’May), the host of a popular television program that’s sponsoring a New Year’s Eve musical contest at the Sydney Opera House, with a top prize of $25,000 for the winning act. With the bank threatening to foreclose on their family’s pub, Jackie and Angus are willing to do whatever it takes to win that money, even if it means crashing the contest and ultimately landing in jail. 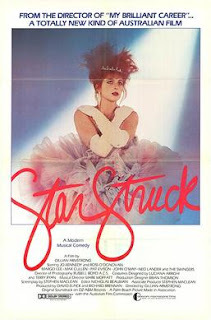 Directed by Gillian Armstrong, Starstruck is a 1982 Australian film with amusing characters and a whole lot of heart. But it’s the movie’s high-energy musical numbers that truly stand out. The first time we hear Jackie sing is at the Lizard Lounge, a local teen hangout, where she takes the stage in a kangaroo costume, then knocks the audience dead with her rendition of “Temper Temper”, one of several original tunes performed throughout the movie. With a style reminiscent of an ‘80s music video, this sequence is certainly dynamic, but is merely a warm-up for the film’s best number, “Body and Soul”, a spirited song and dance routine set inside the family’s pub (“Body and Soul” went on to be a hit in Australia, rising as high as #5 on the pop charts in May of 1982). Even Ross O’Donovan gets in on the act, joining Jackie’s bandmates for “I Want to Live in a House”, an eccentric, chaotic sequence that owes more than a little to The Beatles’ 1964 film, A Hard Day’s Night. Starstruck isn’t without its problems; Jo Kennedy, in her screen debut, is a much better singer than she is an actress, and a few minor subplots aren’t given the attention they deserve (a possibly scandalous love affair between Jackie’s mom and Angus’ estranged father, played by Dennis Miller, goes absolutely nowhere). But with its ‘80s sensibilities and lively musical numbers, Starstruck has charisma to spare, and is a guaranteed good time for all.